Maximatic has been a prominent kitchen appliance company that has been producing new and innovative products to make cooking much more easy, efficient and most of all delicious. This new product Elite Platinum Triple Slow Cooker is no such exception. Suitable for big dinners or large parties, the gadget looks cool while resting atop your kitchen counter and cooks three different meals at the same time. Slow Cookers have been very popular for making meals like roasts, soups, boilers, stews etc that require a specific temperature and a large amount of time to cook. MaxiMatic has come up with an innovative cooking utensil that allows you to produce your family dinner with three separate Ceramic pots that have their own temperature adjustment so you can cook all three meals in whatever heat setting you like. It has been rated with 4.4 stars out of 5 from users due to its durability, exceptional usage properties and easy to use and easy to clean features. And it is also cost effective! You want to know more about it? Then keep reading on. This triple slow cooker has following features. Each pot is of 2.5 Qt made up of black ceramic that can be easily removed and utilized for cooking and cleaning. Each pot has its own temperature setting so you can adjust the temperature of your meals from high, medium and low according to the demands of your recipe hence allowing you a hassle free method of cooking 3 separate delectable dishes in one single slow cooker. Hence they work amazingly for big family dinners and parties. You can easily remove these pots and clean them by either hand washing or by a dishwasher. However they don’t have a timer so you will have to know which recipe takes how much time and keep track of it. As food expands on cooking it is advisable to fill the pot not more than ¾ of its capacity in order to have even cooking and reduce spillage. These glass lids are made up of tempered glass so they can withstand the high temperatures, however it is advised not to open them during cooking and at least leave the pots covered for 2 hours of initial cooking before opening the lids. You can attach these lids with metal clips and serve the meal in the pots without transferring them whether you are enjoying a family feast or hosting a buffet party. Triple Slow Cooker uses 450 W of power hence making it efficient to use. They have a power indicator light with helps you to identify that the pots are now ready to be used. They also are easy to store on your Counter tops although being heavy and large as one unit. The electrical cord can also be conveniently kept rather than kept dangling on your working station making it hazardous for the utensil. Beneath the slow cooker are rubber pads that allow them to stick and stay in their place where you have kept them rather than be easily moved. The manual given with the kitchen appliance is easy to read and has a lot of instructions that will come handy to you while cooking and preparing meals and will ensure the longevity of the product. And if all that wasn’t enough there is a directory as well that contains numerous delicious recipes that you can cook for your family and friends in this innovative kitchen appliance. Although each pot has a separate heat setting but they lack a separate timer setting so you will have to keep track of all three meals by yourself. Each pot can be filled to a specific amount, so if you are planning to cook very large amount of meals for a large gathering then this might not be an option for you. They require space for placement on your counter tops. The ceramic pots are sensitive to temperature so do not put food in it until and unless it is of room temperature. The pots should not be kept in the refrigerator for storage or microwave oven for reheating purposes. 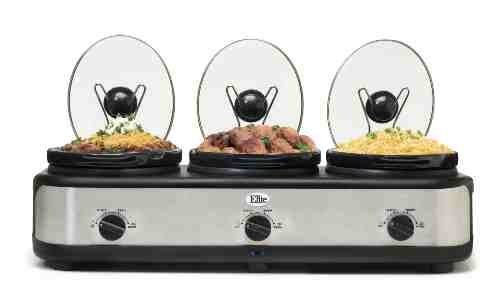 This is an appliance that is not only less time and energy consuming but also great for making 3 meals in one appliance. So for those of you who want to have a hassle free Sunday night family dinner that is easy to cook, takes less time to prepare, gives you more time to relax and above all tastes great, the MaxiMatic triple slow cooker is a great catch. However, if you are hosting a big party or if you have less space on your working station already then buying it wouldn’t be a great option. This is a perfect easy to use, easy to keep, easy to clean 3 in 1 kitchen appliance that is being given at a great price. And who doesn’t likes stress free and sweat free cooking? Couple that with a directory of several great recipes to make and voila you have got yourself a great kitchen appliance.